GOLD AND BLACK ILLUSTRATED VOLUME 28, ISSUE 6 39 J a'Whaun Bentley and T.J. McCollum graduated. So did Gelen Robinson, Danny Ezechukwu and Austin Larkin. The same for Da'Wan Hunte and Josh Okonye. All were starters. They're not, however, the only departures. Key re- serves Eddy Wilson and Garrett Hudson, along with fellow backup Antoine Miles, are also gone. Those 10 were integral to the Boilermaker de- fense in 2017, which featured such incredible and unexpected improvement that it became one of the Big Ten's biggest storylines. Arguably, it was the reason the Boilermakers won seven games, the pro- gram's most since 2011, including the Foster Farms Bowl in December. But that was then. 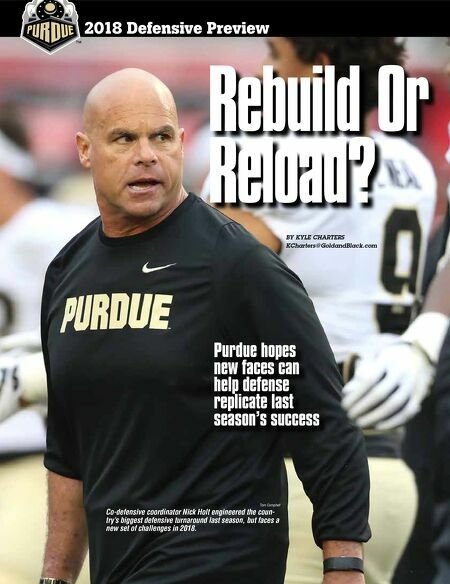 Now, the Boilermakers look to new, inexperienced faces, along with a few holdovers, to try to replicate what they accomplished last season; it might be a tall order, but one they're striving to reach. "I've talked to the younger guys all the time that (the defense) might look complex and difficult when you see so much stuff going on, but when you un- derstand your part and everything comes together, and you can just play fast and run the ball, that's 50 percent of it right there," said junior safety Navon Mosley, one of four returning starters. "A lot of the younger guys, they weren't on the field as much (last year), but they got to see some good players do it, so they know what it looks like to be effective." The Boilermakers were more than effective last season, as they allowed only 20.5 points per game, good for the eighth-best in the Big Ten and 24th in the country. Consider where it had come from: In 2016, Purdue gave up 38.2 points, an all-time pro- gram worst, and 445.8 yards per game, the worst and second-worst marks in the Big Ten, respective- ly. In terms of points allowed, the defense made the nation's biggest jump. Co-defensive coordinator Nick Holt's scheme — Tom Campbell Lorenzo Neal is now the defensive line's undisputed leader, after seeing the rest of Purdue's 2017 starters, and an important backup, depart. The junior needs to step up in leadership, conditioning and production.